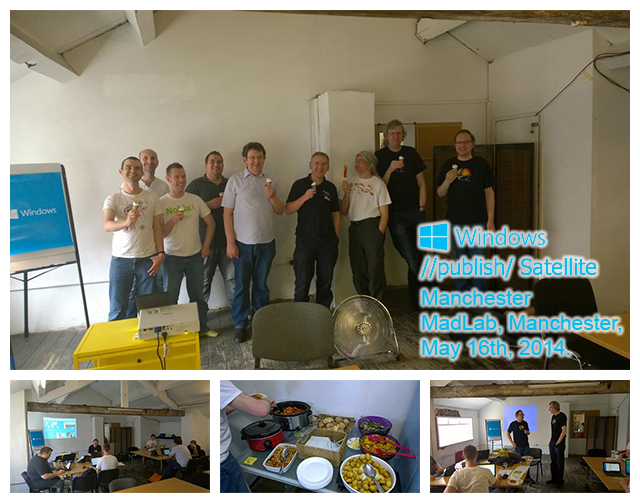 Yesterday I was at MadLab in Manchester to attend the Northwest England leg of Microsoft's //publish/ Windows event. Across 48 hours, 60 //publish/ events have taken place worldwide, to encourage people to develop and publish apps to both the Windows Store and the Windows Phone Store, either as standalone apps, or as Universal Apps for Windows 8.1 and Windows Phone 8.1. Over the last few weeks, I have been busy at work developing Windows Phone 8 ports of our AZoNetwork Apps. I am pleased to say that all 9 were published onto the Windows Phone Store yesterday, and arguably the WP8 versions are the best looking versions, when compared to their Android and iOS counterparts. It was a good event in Manchester yesterday, with the expert help available from Microsoft MVP representatives. There was also an opportunity to mingle with other local developers, try out some of the latest Windows devices, and enjoy some great food courtesy of MadLab. Thanks to Pete Vickers, and team, for organising the Manchester event, and for providing the photography for my picture collage. I will be supporting Windows Phone in the future. Expect ports of 'Mike Irving Apps' soon! Microsoft do a lot for their developer community, with events such as this one. Extra incentives are also available via the DVLUP program, which sets challenges for developers and rewards them for their efforts. DVLUP Challenges are available for app development on Windows Phone and the Android based Nokia X platform.